Celebrate arts at the amazing Centerfest 2018 with the Durham Arts Council both Saturday September 15 (from 10 am to 6 pm) and Sunday September 16 (from 11 am to 5 pm). There’s a reason why this will be our 44th annual celebration in Durham, North Carolina near Morehead Manor Bed and Breakfast. This is the Bull City’s signature arts festival. This exciting event showcases more than 145 juried visual artists from near and far. Many stages will feature music, dance, and other live performers. In fact, there will be more than 75 performing arts groups. Talented singers, dance troupes, choirs, bands, jugglers, musicians will entertain all throughout the event. There’s even extended Saturday entertainment from 6 pm to 11 pm. Serious art shoppers will appreciate world-class ceramics, jewelry, paintings, woodwork, and everything in between. It’s never too early to start holiday shopping! Durham, North Carolina is famous for our food trucks and foodie culture. Food vendors will be there to keep those in attendance fueled with enough energy to continue the fun. This event is organized by the Durham Arts Council, a nonprofit that serves our local community. Other nonprofits that will be represented at the event include: Bike Durham, Durham Ballet Theatre, Durham Community Chorale, and Sister Cities of Durham. 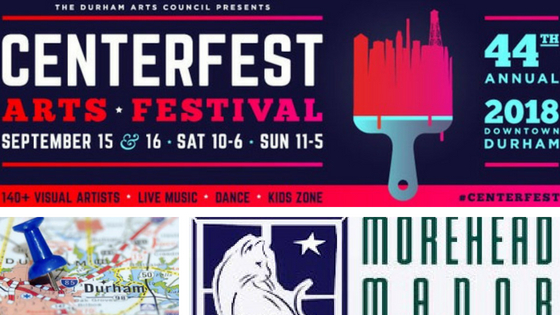 In the heart of Durham’s historic downtown loop (on Main, Chapel Hill, Morris, Market, Corcoran, and Parrish Streets in the Five Points and CCB Plaza areas), celebrate arts at the amazing Centerfest. Not only does this support the local art community, the people who attend have a great time! Stay at Morehead Manor Bed and Breakfast while you attend this fun local event. This entry was posted in Events and tagged arts at the amazing centerfest, Durham, Durham Arts Council by admin. Bookmark the permalink.